IBC Water is part of the Continental Water Systems Group of companies ... more information. Since 1888, IBC Water has a proud tradition in the supply of filtration and water conditioning products for commercial, industrial and residential application. We are well known and highly regarded as a reliable business partner. 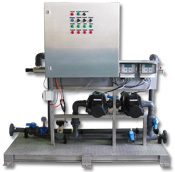 Service: installing and servicing our complete range of water and waste water treatment systems. Our wholesale division supplies an extensive range of water filtration and treatment products to our reseller customers. The majority of our wholesale products have a residential or semi-rural focus, such as domestic under-sink water filter systems, water softeners, and bore water treatment systems. Our wholesale range includes water filter housings and systems; filter cartridges and membranes; water softeners; whole-of-house ultra violet systems; water coolers; and a wide range of parts, chemicals and media to suit our filtration products. We also offer a technical recommendation service to our resellers, based on water testing and analysis. In this way, we help them to provide the best solutions for their customers' specific water treatment needs. Ongoing maintenance services at regular intervals. Our dedicated service team provides support for these systems: water softeners, multi-media filtration, clarifiers, de-ionisation, reverse osmosis and membrane systems, ultraviolet purification, ozone disinfection, chemical dosing and waste water treatment. Our passion has driven us to create some of the most reliable products and approaches to water quality problems in the Australian market today. Our years of experience and our successes in this field have led to an accumulation of intellectual property and quality processes that are second to none.